Printed Reply-paid envelopes are one of the best ways to encourage a quick response. 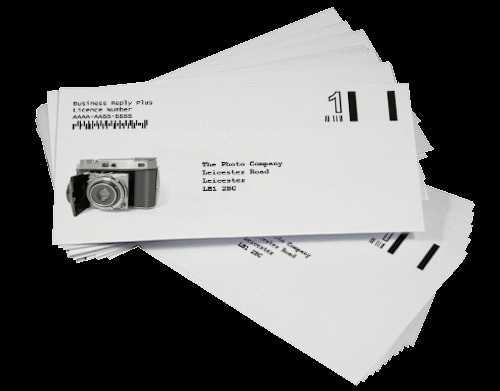 A cost-effective short-run envelope printing service for most applications. Whether or not you request a proof, all supplied artwork files undertake our rigorous 10 point file check to ensure your printed job turns out exactly as you intend. We use environmentally friendly self-seal 90gsm envelopes that offer a good balance between quality and value. They are available in all the most common sizes and for security purposes are printed with an opaque pattern inside the envelope to obscure the contents. Envelopes are printed using Memjet technology. Memjet is a form of high speed inkjet printing that delivers good quality digital print at a reasonable price. It is NOT suitable for envelopes requiring heavy coverage but prints logos, lines and text to a very high standard. Printed envelopes are re-packed in their original boxes ready for carriage. As all reply-paid envelopes need to conform to Royal Mail's standards, please use their artwork generator located here. Please select the PDF option to send to Flexpress for printing. For artwork best practice, take a look at our Artwork and File Information page.